Warm, fertile, well-drained soil with a slightly acidic pH. Yes, but most grow and crop more reliably under cover in cooler climates. Persimmons usually need no fertiliser when grown in lawns. Too much nitrogen can cause fruit to drop. Set out plants in late winter or early spring. Persimmons do not need to go through a frost to be palatable, but they do need plenty of time to finish ripening after they have been picked. 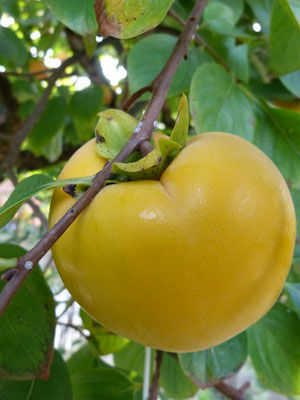 Persimmons may take seven years to start bearing, and then produce for decades. Cut fruits from the tree before they are ripe, retaining the short pedicel. Store in a cool, dry place for up to four months. Watch for aphids and other small sucking insects, which can often be brought under control with insecticidal soap.